We passed through Swaziland on our epic road trip through South Africa. Unfortunately, we only had one day in Swaziland (well, technically one night). I wish we had had more time, but divvying up 30 days across a country FULL of amazing places to see isn't easy. Decisions have to be made. And we were left with just the one day in Swaziland. And here is what we did. When we visited in 2017, the country was still named Swaziland. In April 2018, the monarch officially named the country's name to eSwatini. It's a return to the nation's original name, prior to colonization. Swaziland was a blend of English and Swazi and was never loved by all of its citizens. We were coming from Kruger so we started the day at 5 am driving through the park, squeezing in one last safari. Leaving Kruger and driving to the border was easy and the roads were great. I had one mild moment of panic when I realized I had forgotten to get the permission letter from Avis to take the car across the border, but no one cared or asked. However, it would have been awful to be denied entry for such a stupid mistake, so make sure you have that. Immigration was simple and quick. You pass through one building to get your exit stamp for South Africa. Then you pass through Swaziland immigration for your entry stamp in another building. There are public restrooms, just in case you've been cooped up in that car for just a bit too long. The official currency of Swaziland is the Lilangeni (or plural: Emalangeni). However, everyone accepts the South African Rand. If you're not going to be spending much time in Swaziland it's better to just bring Rand with you, rather than get stuck with leftover emalangeni in your pocket (that won't be accepted in South Africa). Where to Stay in Swaziland. 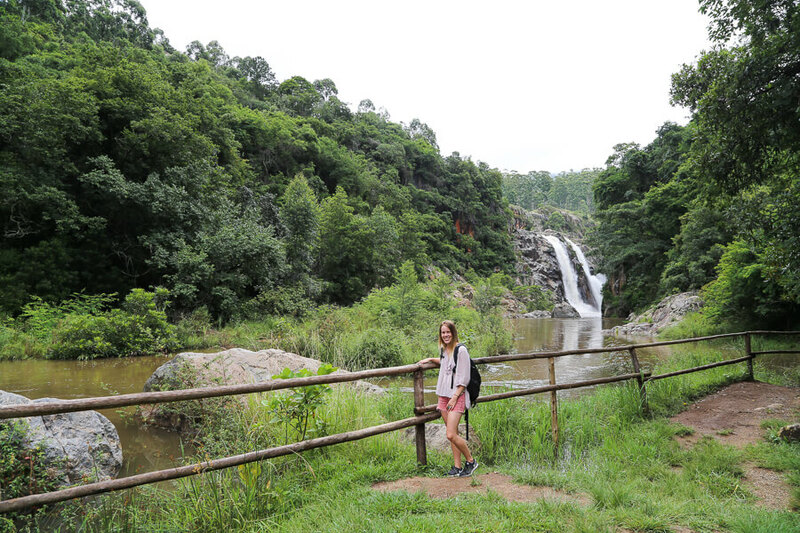 Swaziland was incredibly green and beautiful, with lush forests and mountains. We stayed at the Mantenga Lodge in the Ezulwini Valley. It was an easy drive that took us just about 3-4 hours after exiting the southern Malalene Gate in Kruger. We got to the lodge at noon. Proof that SO much can be done in a day in South Africa: by noon we'd already enjoyed a three-hour safari and driven to another country! The lodge was nice enough, the rooms were standard and nothing special. The location, however, was stunning. And the food was incredible! We ate one of the best dinners of the entire trip there, so I would recommend staying there for the food alone. The view (seen below) from the restaurant was also hard to beat. Check rates here. At first, I was unsure about visiting a cultural village. I was concerned it would feel forced, fake, or like a sort of "people safari." 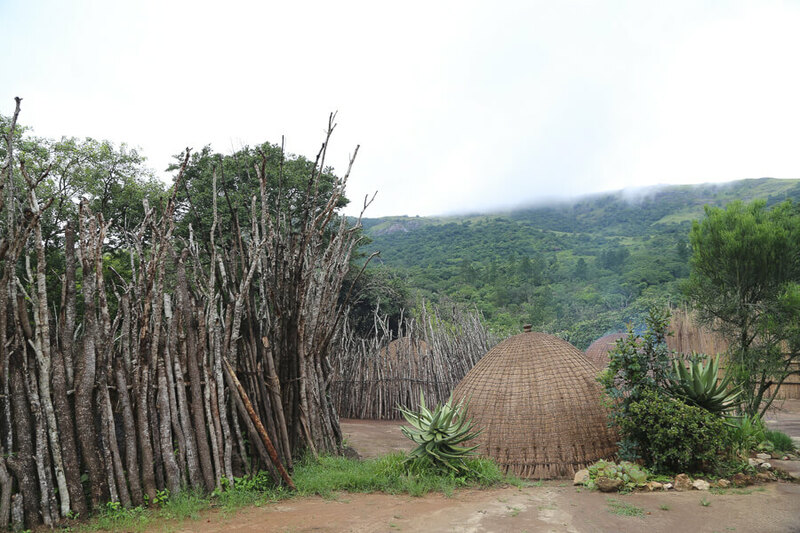 But after reading such great reviews about the Mantenga Cultural Village, I decided to go for it. I have no regrets, it was a great experience! The cultural village is located in a lush, green nature reserve. We got there at around one in the afternoon and had two hours to kill before the traditional dances at 3:30. We took the right turn at the cultural village and drove uphill to see the Mantenga Falls. The weather did not want to cooperate with us, so we waited out the rain in the car, eating a picnic lunch. When the rain broke we did the short, easy hike to the falls. Those who withstand the rain are blessed with beautiful waterfalls all to themselves, tourist-free. I'm VERY glad we did this. 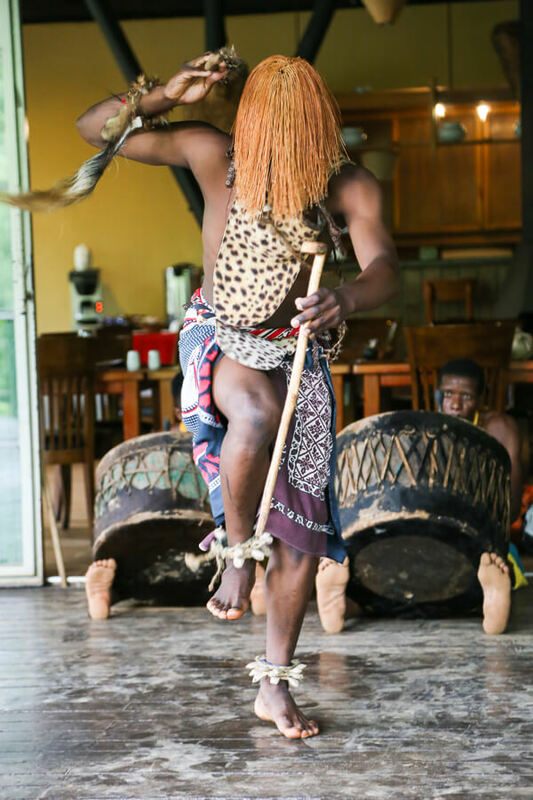 It was great to learn about the traditions and culture of the Swazi people. Luckily, there weren't actors acting out daily life (which I think would have felt a bit uncomfortable). I'm not sure if that was the norm though. It was very interesting to learn about family dynamics and see how the homes were built. I recommend arriving early to tour the living village beforethe dance performance begins. We came down from the falls for the tour at around 2 and were able to enjoy a private tour. The dance was very crowded and everyone toured the village together afterward. Go early and beat the crowd. There is a traditional dance performance at every day at 11:15 and 3:30. First, the women danced, performing dances women traditionally danced just amongst themselves. Then it was the men's turn, both dancing with powerful drums. After the dancing, the troupe sang gospel music and offered their cd for sale to the guests. It was very impressive and everyone seemed to be passionate about what they were doing. We spent the rest of the day after the cultural village relaxing at the hotel. The manager of our hotel could not stop talking about the Swazi candles. You MUST see the Swazi candles. You CAN'T MISS the Swazi candles, she insisted. Apparently, it's one of the most popular tourist attractions in Swaziland. I like candles and all, but I think there must be better things to do. But we couldn't ignore such a strong recommendation so we made time for a visit in the morning as we were leaving. I enjoyed watching them mold the rhinos and giraffes by hand. There are other shops and a cafe on the property as well, visit here for a list. Also based on our hotel manager's recommendation we visited the Man on Fire cultural center and event space. It was interesting, to say the least: full of mosaics and art installations. It felt odd to be there in the morning when nothing is happening though, so if you have more time try to visit when there's more going on. For example, the space hosts the annual MTN Bushfire Festival. Colorful, high-quality hand-woven baskets woven by Swazi women. If you want to bring back souvenirs and gifts that people actually want, this is it. The baskets are woven from indigenous and renewable fibers. 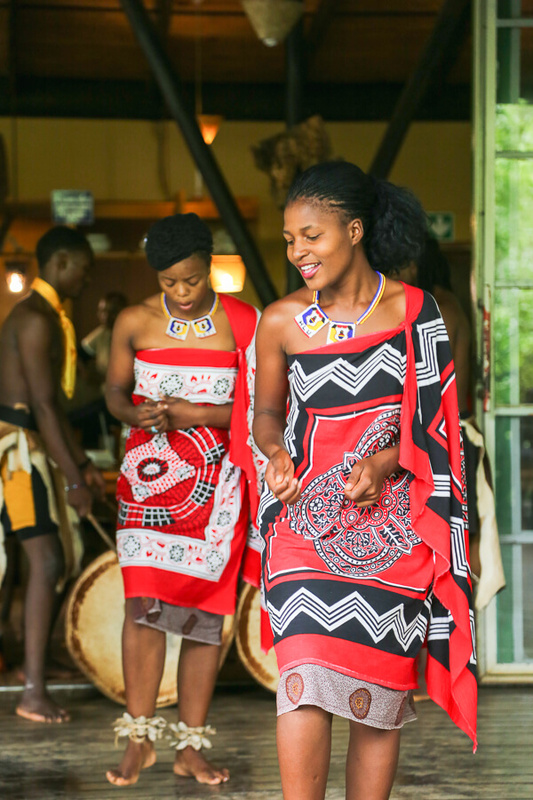 They are committed to uplifting and empowering women, providing work for 760 Swazi women. They also give back to the local community in the form of health programs, educational scholarships and access to clean drinking water. That was the end of our day in Swaziland, it was a jam-packed 24 hours. It's definitely not enough time, but I'm glad we were able to see as much as we did. There were a lot of options for more adventurous travelers, such as hiking and mountain biking. If you want to see wildlife there are options like national parks and safaris. Despite everything we had to miss out on, I'm happy with our day. We came, we saw, we loved it. BONUS TIP | The roads were fantastic in Swaziland, but after crossing through immigration (above) and re-entering South Africa on our way to St. Lucia, we encountered the worst road I have ever seen in my life. There were so many potholes it was impossible to avoid them. It was just a choice of which pothole you hit, and we couldn't drive faster than 10 km/h. It took us ages and left me with a throbbing headache for the rest of the day. Beware if you're driving this way and allow yourself a bit of extra time.